What is the offline error message? Whenever a live stream or a VOD is offline or is having an issue, you will see a offline error message on top of your video content. 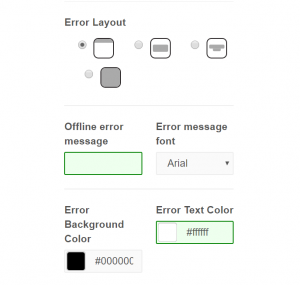 What is the benefits of customizing the offline error message? How can I customize the offline error message? This is the position of the error message within the player. It can be on top of your video content, in the middle of the screen or at the top of the screen (please see screenshot below). You can then click on “Preview” to have a look at your new player theme. You’re all set, your new offline message is online ! For more information on how to set up a player theme, click here.